Simple regulator design for use with high pressure systems. Precision design that has an accurate and easy to adjust output. Industry standard nut, compatible with DIN 477 / BS 341 No. 8 / JIS m22-14 / W21.8-14 / .860" x 1/14 (covers UK, Europe and Asia). Works with 4mm or 6mm tubing. A simple but very well designed CO2 regulator. Features an easy to fit design, with in-built needle valve for fine-tuning of CO2 dosing. When releasing CO2 from a cylinder, a key requirement is to ensure that the release pressure of CO2 is controlled in order to deliver it in a controllable manner. The flow of CO2 can be fine-tuned using the needle valve, ensuring that the quantity of CO2 released can be easily adjusted for your requirements. Tighten nut to CO2 cylinder or adapter using appropriate sized wrench or spanner (do not attempt to hand-tighten). Fully close the needle valve by turning clockwise. Connect your bubble counter or tubing to the regulator. Open flow of CO2 on the cylinder. Open flow of CO2 out of the regulator by turning the needle valve anti-clockwise. 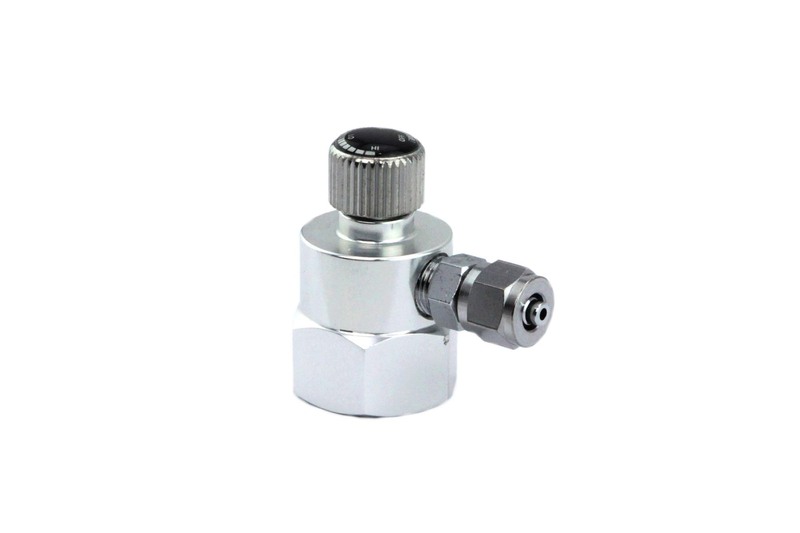 Adjust needle valve until desired flow rate is achieved. The CO2 dosage is not easily adjustable. It is better to take a Single Stage CO2 Regulator. The CO2 dosage is not easily adjustable. It is better to take a Single Stage CO2 Regulator. Great product. Get that with the precision needle IF you want to really control the flow. Great product. Get that with the precision needle IF you want to really control the flow. A very helpful staff member pointed me in the right direction to a Co2 control device that will not being used for aquatic purposes. A very helpful staff member pointed me in the right direction to a Co2 control device that will not being used for aquatic purposes. Does everything you need it to do, nothing fancy but a worthwhile purchase. Does everything you need it to do, nothing fancy but a worthwhile purchase. Item works as described...just waiting now on the yields from future plant development. Took me awhile to get things dialed in but it's working now..may have to to invest soon in a 2.5 or 5lb C02 tank. Time will tell..thank you! Item works as described...just waiting now on the yields from future plant development. Took me awhile to get things dialed in but it's working now..may have to to invest soon in a 2.5 or 5lb C02 tank. Time will tell..thank you!